Simplify the task of running distributed audio for restaurants, hotels, or anywhere large areas need background music and/or paging address systems. Connect hundreds of speakers covering acres of area without the need for large equipment racks. A constant voltage speaker system differs from a traditional 8-ohm speaker system in that it uses a step-up transformer at the audio source to raise the voltage and lower the current on the transmission line. At the speaker end, a step-down transformer converts the signal back to a normal speaker level voltage. This reduces power loss during transmission, which allows for the use of longer speaker wire runs using smaller gauge wire. Additionally, a constant voltage speaker system allows for the use of multiple speakers on each channel, without the need for complicated impedance calculations and configurations. In a constant voltage system, all speakers on a given channel are connected in parallel and the complicated impedance calculations are replaced by simple wattage calculations. For example, if you want to connect two speakers per channel in a traditional 8-ohm speaker system, you must either connect them in series, which results in an overall 16-ohm impedance, or in parallel, which results in an overall 4-ohm impedance. In the first case, the 16-ohms impedance effectively halves the output power of your amplifier, resulting in lower overall volume levels. In the latter case, the 4-ohms impedance means that your amplifier will have to work harder and must be rated as stable at 4 ohms. Adding a third speaker to the mix would complicate it further, producing either a 24-ohm or 2-ohm overall impedance. Note that very few amplifiers are stable under 2-ohm loads, so that is usually not an option. On the other hand, with a constant voltage system, you consider first the RMS output wattage of the amplifier. This should be reduced by 20% to compensate for insertion loss. For example, if using a 100-watt amplifier, the total load from speakers should not exceed 80 watts. 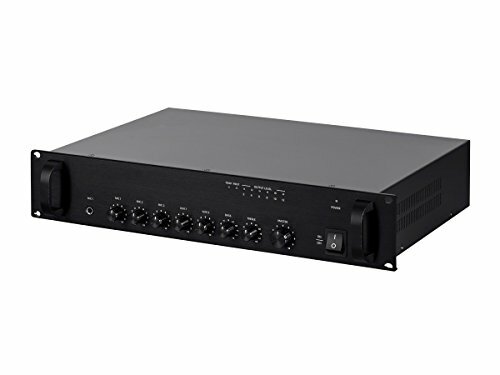 This amplifier features three microphone inputs and two auxiliary inputs, each of which is active and mixed into the line and speaker level outputs. When an EMC input trigger is detected, all outputs except MIC 1 are muted, allowing for the clear broadcast of important messages. The amplifier can drive a speaker array consisting of one or more speakers presenting a 4~16 ohm load or to one or more 70V or 100V speakers connected in parallel as part of a large public address system. Flexible configueration for any facility includes 2x XLR, 3x 1/4", and 4 RCA Pairs on a 5ch mixer. Dedicated EMC emergency killswitch to all inputs except Mic 1 for anouncememnts and seftey instructions.